The ECCT's Human Resources committee co-hosted a lunch with the Taipei European School (TES) featuring guest speaker Kerry Nockolds, Director of Admissions and Student Services. 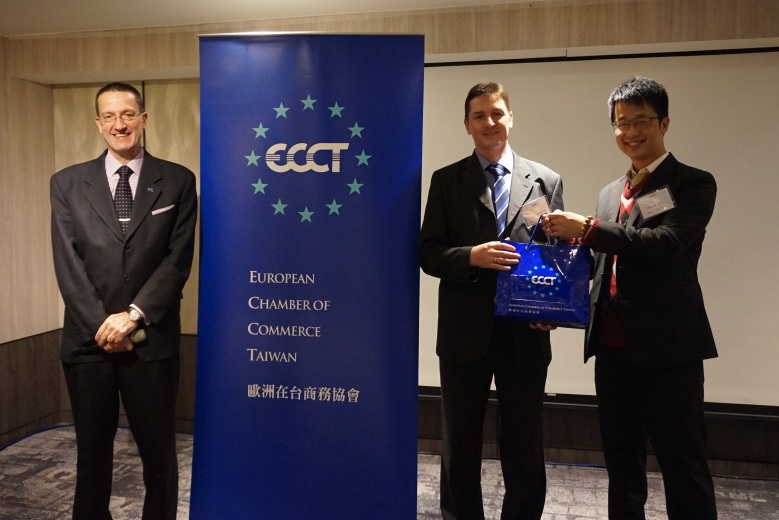 At the event the guest speaker outlined the various considerations that expats, or their employers acting on their behalf, need to know to ensure the greatest chance of gaining a place at TES during their postings in Taiwan. His presentation covered the requirements, procedures and expectations from the perspective of the school. The presentation was followed by Q&A session. Also at the event, Nancy Chien, Head of TES’s University Career Counselling service introduced TES’s internship programme for high school students. Under the programme, which is supported and promoted by the ECCT, member companies offer short week-long internships to TES students at their companies to give them valuable work experience. Kerry Nockolds began by giving an overview of TES, explaining that the school’s four sections (British Primary, British Secondary and High School, French and German sections) offer students a path to international universities by following International Baccalaureate (IB) programmes. There is high demand for places at TES, which is why parents or HR staff working on behalf of expats with school-going children, are advised to become familiar with the school’s application requirements, procedures and expectations. A good way to start is by reviewing all the relevant information and application forms on the school’s website. Nockolds stressed at the outset that applications for attending TES that are submitted before the deadline of 28 February (in order to start school in August) stand a much better chance of success, provided the applicants are qualified and there are sufficient places. Applications received after the deadline will only be considered after all the others that were submitted before the deadline. Given the shortage of spaces at the school, priority is given to: 1) Those with European passports and proven residency status; 2) Native speakers of English, French or German or students that had previously been enrolled in the same curriculum or system; 3) Children who have older siblings already enrolled at the school; 4) Children who have lived in an English/German/French environment. Candidates are asked to submit reports from previous schools and be subject to interviews by TES staff (both parents and students are interviewed). Other factors may also be considered before making final decisions. For example, if the normal selection process leads to a large gender imbalance, TES reserves the right to prioritise other students in order to ensure a good gender balance. In addition, while TES has some ability to meet certain special education needs, there is a limit to this ability and the school may have to turn down some applicants if reviewers feel that TES is not able to adequately meet the student’s learning needs. When reviewing applications, besides reports, TES staff will assess students’ language and cognitive abilities and look at their parent’s language environment. For students outside of Taiwan, remote assessments can be conducted. All candidates who pass certain benchmarks are considered for enrolment based on the priority criteria. Final decisions on applications are made by the headmasters of the four respective TES sections. If there is no place for qualified candidates, they are placed on a waiting list. They are also automatically placed on the list of qualified candidates for enrolment in the following year. Candidates that do not pass the initial review process may reapply after six months. The speaker went on to describe the complex method for estimating future expected enrolment numbers and how the school tries to maintain optimal classroom sizes (of 22 students) while also leaving space to accommodate expat children who arrive during the school year. He concluded by stressing the need for applicants to meet the deadlines for submissions and paying school fees on time (if the payment deadline is missed, the place will be allocated to the next candidate on the waiting list). After Kerry Nockolds’ presentation, Nancy Chien gave an introduction to TES’s internship programme for H1 students, which has been scheduled for the week of 3-6 June this year. The purpose of the programme is to give young students an introduction to working in the real world. ECCT member companies will be asked to offer internships to young students and to arrange learning activities for the students during their internships. For their part, students will be asked to write letters to describe why they would like to work at particular companies. They will also be required to write reports on their working experiences.